A Data Series represents a series of price data, which can be displayed on a chart using one of several Bar Types and Chart Styles. One or more Data Series will be applied to a new chart when it is created, and additional Data Series can be added, edited, or removed via the Data Series window. The Data Series window is used to configure the Data Series within a chart, edit Data Series parameters, and save default values for different Period Types. 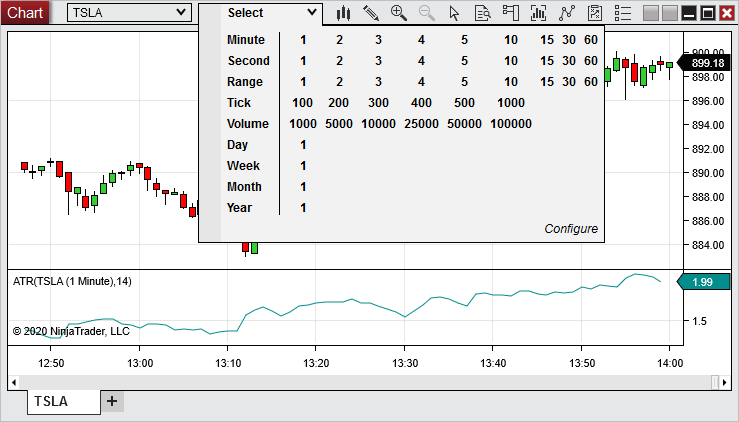 •Select the New menu from the NinjaTrader Control Center, then select the Chart menu item. •Right mouse click in the chart background and select the Data Series menu item. •Use the default CTRL+F Hot Key from an open chart. •Double left mouse click on a Data Series within the chart. •Right mouse click on a selected Data Series within a chart, then select the Properties menu item. The image below displays the four sections of the Data Series window. 4.Saved Chart Templates that can be applied to the new chart. See the Saving Chart Defaults and Templates page for more information. Note: If a Chart Template is selected, settings from that template will take precedence over any settings manually configured on the Data Series. 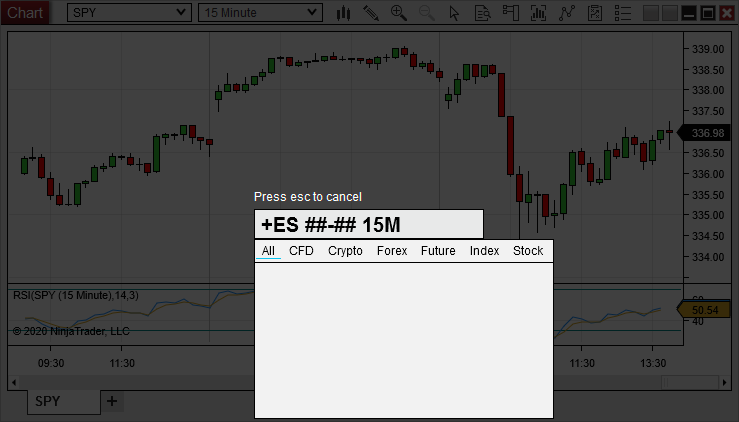 For example, Trading Hours currently configured will be ignored, and the chart will use the Trading Hours which were saved in the Chart Template. 1.Use the Instrument Selector dropdown menu to select a recently used or pinned instrument, or any instrument in an Instrument List. 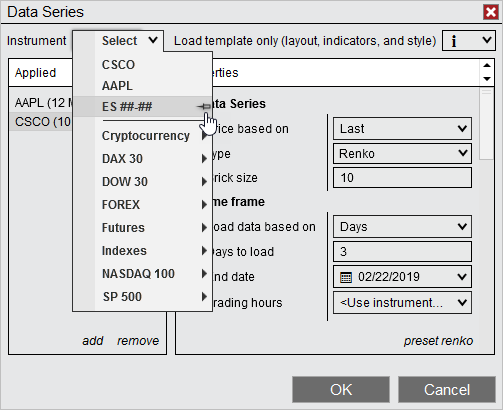 2.Type the instrument symbol (including the contract month for futures instruments) directly into the Instrument Selector, then press the "Enter" key. 3.Left mouse click on the magnifying glass icon next to the Instrument Selector. In the window that appears, use the search field to search available instruments by symbol or description, then double left mouse click on an instrument in the search results to add it to the list of applied Data Series. The added Data Series will now be visible in the list in the "Applied" section, allowing you to change any parameters to desired values (see the "How to edit Data Series parameters" section below). Tip: A Data Series can also be added by typing directly into an open chart. Type the plus symbol (+) followed by the instrument symbol, contract month for Futures, and appropriate interval value. For example, typing "+ES ##-## 5M" will add a 5 minute ES continuous contract Data Series to the selected chart (See the "How to change a Data Series" section below for more information). In the image above, we can use the Instrument Selector to add a recently viewed or pinned instrument, as well as any instruments in an Instrument List. A Data Series object's parameters are available to configure within the Data Series window once it has been added to a chart (see the "How to add a Data Series" section above). 1.Open the Data Series window (see the "Understanding the Data Series window" section above). 2.Select the Data Series you would like to edit in the "Applied" section. 3.Once selected, the Data Series parameters will be available to edit on the right hand side. Sets the bar type of the Data Series. See the Bar Types page for more information. Determines how much data is loaded based on number of bars, number of days, or a custom date range. Sets the value for the amount of historical data to load, based on the "Load Data Based On" setting. The label on this property will change based upon what you have selected for the "Load Data Based On" property. Sets the end date of the chart. 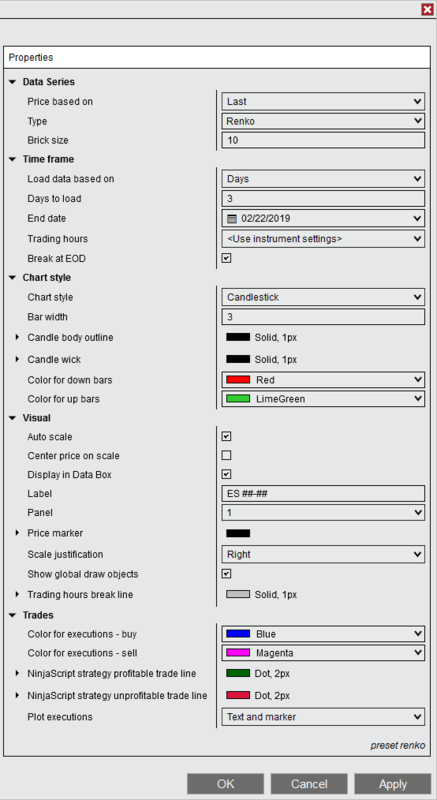 If the specified end date is within the range of an applied Trading Hours template whose end time falls on a future date, then the Chart will end on that future date. 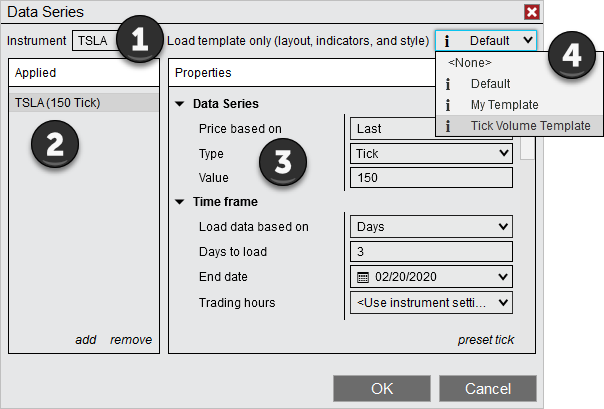 Sets the Trading Hours template to be used for the Data Series. See the Trading Hours page for more information. When enabled bars will be cut off at the end of the Trading Hours session regardless of whether it is fully complete. So a 10 range bar may close with a range of 3 or a 4 hour bar may close after 2 hours. When disabled, such a bar will continue to develop until it is complete, potentially causing it to post outside of the Trading Hours session. For more information, see the Break at EOD page. Sets the style of the bars. Custom Chart Styles can be created via NinjaScript to extend the pre-built list. Additional options for configuring bar colors and related properties will be displayed beneath the Bar Width property, depending on which Chart Style you have selected. When enabled, the Data Series will be part of the chart's auto scaling. •In case the chart is set to a fixed scale, this property has no effect. •In case there are no objects on the chart which have this property set to true, the first chart object will be used for the chart's auto-scaling. 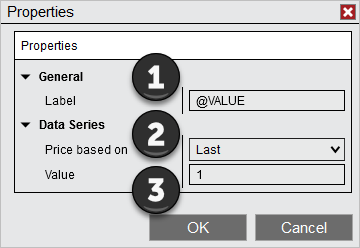 Sets the label text to be displayed in a chart panel when more than one Data Series has been applied to a chart. This can be left blank to remove the label entirely. Sets the panel in which the selected Data Series will be plotted. When more than one Data Series has been added to a chart, all but the first Data Series in the list will provide the option to plot in a New Panel in the "Panel" field. Expanding this property will allow you to change the color for the price markers on the chart, as well as enable or disable the price markers' visibility. Sets the scale on which the Data Series will be plotted. Possible values are "Right," "Left," and "Overlay"
Sets whether Global Drawing Objects will be displayed for this Data Series. See the "Understanding local vs. global drawing objects" section of the Working with Drawing Tools & Objects page for more information. Sets the plotting style of the trade executions. Note: Real-time executions are timestamped based on the timezone set in the "General" section of the Options window, which can be accessed from the Tools menu in the Control Center. Please see the How Trade Executions are Plotted page for more information. You can optionally save your customized Data Series parameters as default. Defaults are saved based on the Interval Type selected. Saving defaults will recall your customized settings the next time you add a Data Series with that specific Interval Type to a chart. Please see the Saving Chart Defaults and Templates page for more information. Data Series can be edited in several ways after being added to a chart. 2.Select a recent or pinned instrument from the top of the list, or expand any of the Instrument Lists for additional selections (for more information about editing Instrument Lists, see the Instrument Lists page). The Interval Selector can be used to change a Data Series interval directly from the chart toolbar. The Interval Selector comes pre-populated with commonly used intervals, but you can add additional intervals of your choice at any time. To access the Interval Selector, left mouse click the dropdown menu displaying the currently selected interval, located next to the instrument dropdown menu on the chart toolbar. To change the currently selected interval, select any of the values corresponding to the row labeled with your desired interval type. For example, to switch to a 5,000 Volume interval, click the "5000" option in the "Volume" row. 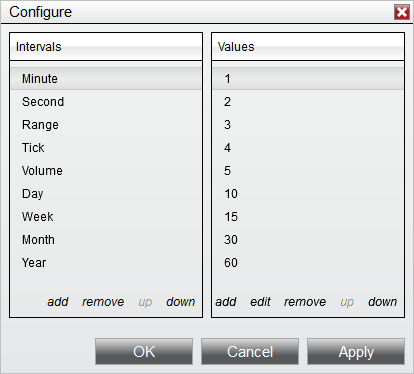 To add a new interval to the Interval Selector, first click the Configure option. The Configure window that appears is separated into two sections. In the "Intervals" section on the left side, you can select any existing Interval Type to view, add, edit, or remove any specific interval value set up for that interval type. In this section, you can add new Interval Types to the list via the add option, remove an Interval Type from the list via the remove option, or move Interval Types higher or lower in the list via the up and down options. In addition to the Interval Types already available, you can add Heiken Ashi, Kagi, Line Break, Point and Figure, or Renko to the list. 1. The "Label" field sets the label that will be displayed in the Interval Selector for this interval. Entering "@VALUE" in this field will display the value entered in the "Value" field in the section below. Alternatively, you can enter any text or numbers in this field to label the interval. 2. The "Price Based On" field determines whether the underlying Data Series will be based upon the Ask, Bid, or Last price for the selected instrument. 3. The "Value" field sets the value to be used for the interval, based on the Interval Type. To remove an interval from the list for a specific interval type, first select the interval, then select the remove option. To edit the parameters of an existing interval, select the edit option instead. To change the placement of an interval in the list, first select the interval you wish to move, then select the up or down options to move it higher or lower in the list. Moving an interval higher in the list will cause it to be displayed further to the left in the Interval Selector, and moving it lower in the list will cause it to be displayed further to the right. The Configure window pictured above allows the addition, removal, or editing of interval types and specific intervals in the Interval Selector. You can change instruments or intervals by pressing a letter or number key in a selected chart. When a letter or number key is pressed, the Instrument Overlay appears. Within the Instrument Overlay, you can change the instrument, interval, or chart type by using the formats in the table below and pressing the "Enter" key when finished. If multiple instruments are displayed in the chart, you can change a specific instrument by left mouse clicking to select it before typing. If no instrument is selected, the primary instrument is changed. Type the instrument symbol (Add the contract month for futures instruments). Examples: "ES ##-##" for E-mini S&P 500, "AAPL" for Apple stock, or "EURUSD" for Euro/USD forex pair. Type interval value plus the interval suffix (Value +suffix). Examples: "5M" for 5 minute bars, "100T" for 100 tick bars, "1D" for 1 Day bars,10 etc. Type the symbol and interval together. For example, typing "AAPL 5M" will change to a 5 minute chart of Apple stock. Type a plus sign (+) plus the interval. For example, typing "+5M" will add a 5 minute Data Series of the primary instrument. Type a plus sign (+) plus the instrument and interval. For example, typing "+AAPL 5M" will add a 5 minute series of Apple stock. If no interval is provided, then the same interval as the primary series will be added. •Open the Data Series window (see the "Understanding the Data Series window" section above). Select a Data Series from the "Applied" section, then select the Remove option, then press the OK button to close the Data Series window. •Left mouse click a Data Series on your chart to select it, then press the "Delete" button on your keyboard. •Left mouse click a Data Series on your chart to select it, then right mouse click the Data Series and select the Remove menu item. If only one Data Series is applied to a chart, it cannot be removed. However, the original Data Series added to a chart can be removed if there is at least one other Data Series is still applied.